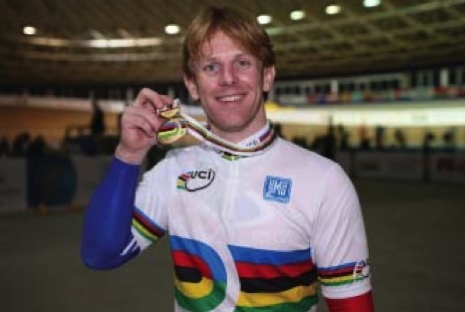 World Championships Review, Montichiari, Italy 2011 | Cycling Shorts. 1. Could I pull out the pursuit ride my training has been geared to? 2. Would all the pursuit/endurance training I’ve done effect my top end speed? 3. Would 3 events back to back be a step too far? Well question 1 was answered on day one and it was a big yes! 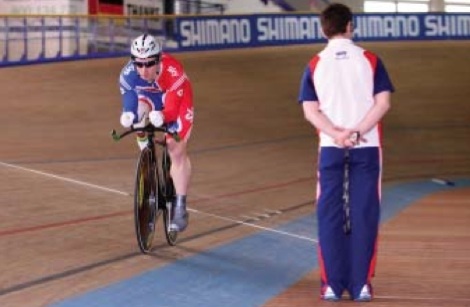 Preparing for the worlds myself and my coach (Chris Furber) targeted 4:45 as a realistic target, if I could do this, then based on previous results this would put me in the top 5 or 6 riders in the world and score a healthy amount of points for the London qualification process. However it would be a massive challenge as my best time prior to the world championships was a 5:03.286. Things had been going well in training, and I was on target, I just had to get up there and put all the components together. With Chris walking the line I tried to keep my 1st kilometre measured and controlled as I’d been finding it easy to get carried away, especially when your legs feel good. More importantly though this had been my big downfall in training and had led to some rather slow and incredibly painful efforts! By the time I reached 3km I was feeling strong and still in control of my speed, and I now had my opponent all set for the catch. I swept by him in turn 3 and then pushed on through to the end, with my legs beginning to really burn with a lap to go, but hearing the bell I just had enough to get me to the finish line. As I looked up to the score board I was amazed to see I’d rode a 4:44.085 (an almost 20second personal best time) and had a rank 1 next to my name! With just one heat to go it meant I’d definitely be doing a 2nd 4km in the finals, but I would have to wait 5mins to find out what medal I’d be racing for. In the final heat world champion and world record holder Jiří Ježek posted the fastest time of 4:41.895, and with his opponent falling short of my time it meant I was a guaranteed silver medallist and I would be racing Jiří in the final. Before the final I talked with Chris and discussed how we were going to attack it, as now I had made the final my competitive nature had taken over, and I wanted to give Jiří a good fight and make him work for the title. My qualifying ride was a controlled measured effort, and I believed I could squeeze out a little more and put some pressure on Jiří. So we decided on riding to the WR schedule, and see what would happen! This was all well and good, however by the time I was at lap 3 I was a long way up on schedule, a very dangerous place to be in a pursuit, especially as this schedule was 4 seconds faster than I rode in the morning. By lap 6 my over exuberance started to take its toll as I struggled to maintain the rhythm and speed I’d started with. Kilo’s 2 and 3 were pretty steady before I managed to find my legs again, but by then my race was over, Jiří had me in sight. I managed to make it to the 4km without being overlapped, but Jiří was world champion, and I now had a new pet project to add to my list for London! With the pursuit over, and all my goals reached and exceeded it was time to get back to events I know and love, and to answer question 2. The kilo was going to be an interesting race, with 25riders down on the start list and team mate Terry Byrne snapping at my heels in training the pressure was on. Terry was off 2nd rider and was out to post the marker everyone would be aiming at, and he did just that blasting out the gate to a 2second PB and a time that only I had gone quicker than, and he’d done this before I’d even started warming up! ￼I was last to go and with Terry’s time still top of the table with Jiří Bouska 2nd and Eduard Novak 3rd, it was time to see how much my legs had recovered from the previous days efforts. Out of the gate and I wanted to get the bike up to speed as fast as possible, 1st lap complete and I was 0.971 seconds up, my legs were feeling good as I settled into my tri bars and continued to accelerate through the middle section of the ride as I crossed the line I was a full 2.55 seconds clear of Terry and 0.3 seconds inside my WR winning time from Manchester 2009. Question 2 was answered, I’d not lost any of my speed, and as a bonus from all the endurance training the last 2 laps didn’t hurt as much as in previous kilos. I think that’s the first time I’ve actually been able to enjoy my victory laps! 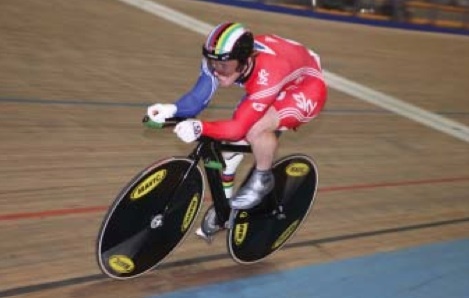 The last day of competition was the team sprint, and I was teaming up with Darren Kenny, who had already successfully defended his 3km Pursuit and Kilo titles in the previous 2 days, and Terry Byrne who would be riding man 2 after his silver medal in the kilo the night before. This was a new line up compared to past events, as the rules and classification classes had changed since the last world championships, as our existing team was no longer a legal line up. With 15 teams riding the competition had become stronger, and in ride 10 the Chinese team set a new WR time of 51.655, taking 0.5 seconds off the existing mark. However this didn’t faze us as we knew that in training we’d been quicker than this new standard. Lined up on the track it was important that we executed the starts and changes over smoothly and legally, as fast as possible, and we did just that, blazing around to a 49.809 to take the top qualification spot and smash the WR in the process. In the final, after looking at the race data from the heats we made some different gear choices and felt confident we could go faster. As we blasted round the track our confidence was well founded as we smashed the WR again, taking it down to 49.540 with the feedback from the morning making a big difference in the final, the Chinese finished in 51.771. With the final race complete and under my belt it was clear all my questions at the start of the week had been answered, I could pull out a world class pursuit, I hadn’t lost any of my top end speed, and to top it off I was still riding fast on the last day of competition, setting the fastest 3rd lap I’d ever done in the heats of the team sprint, with a 14.198. Montichiari was a fabulous experience and one of those weekends of racing that as an athlete you love, because all the hard work has paid off and everything has come together. As a team we topped the medal table with 9 Golds, 8 Silver and 1 Bronze. It’s starting to look good for London. All that’s left to do now is sit down with Chris and analyse the performances and work out how to get even quicker for London. I have a few days off, and then I’ll be back on my bike preparing for a summer of endurance that will hopefully set me up for next year.